"World mode" 3G: One thing Apple is known for is its penchant for keeping things simple (too simple for some techheads, but that's another story). Now that iOS devices are on GSM and CDMA carriers, it's not hard to see them offering a single world-mode tablet that works practically everywhere 3G is offered. More storage options: The iPad 2 comes with three storage choices. But if you're interested in a little more capacity than the 16GB, 32GB and 64GB models can offer, could I interest you in a 128GB iPad 3? I think this is very possible. That HD video camera alone can produce footage that eats up a ton of room, not to mention all the other media you're likely to stash in there. And with iPads selling like hotcakes, it wouldn't be hard to make the case that some people would pay a premium for more capacity. But what about a smaller capacity version, as a recent rumor suggested? Well, if it was about an 8GB iPad 3, I'd seriously doubt it, but since the story revolves around an adapted iPad 2, I think it's possible. First of all, they have the parts, and courting budget consumers is one way to keep breathing life into the iPad line, without having to resort to the headache of a totally new "iPad mini" (see below). Second, the company has already done it in the past with its iPhone, so history could well repeat itself. Better Smart Covers: When Smart Covers were introduced, barely-there, but always-there protection sounded so appealing. Since then, some users have discovered that they lost magnetic properties and that the folded-up covers didn't make for very stable stands. Enter version 2. Whether these Smarter Covers address these issues or not, they will look great and demand for them will be big. HD widescreen display: I completely disagree with everyone who said it was only suitable for HD movie watching, and that it was unwieldy for e-reading and other activities. I found it to be a perfect screen ratio for a variety of uses. And yet, mark my words, there's no way this is coming this year. Not only would it cause a mess in the app development community, but Apple itself pretty much dissed the idea. While it wouldn't be the first time the company contradicted itself — as its departed chief was famous for— it often does take awhile for the company to up-end its own assertions. Oh well — we'll have to "make do" with that stunning Retina Display. An iPad mini: Yes, there have been recent rumors about an iPad mini. Though not slated for an immediate launch, rather for the fall, I still have a tough time wrapping my head around this one. Sure, I'd love to see a more petite offering, say in the 7 to 8-inch range, but right now Apple is embroiled in investigations around its manufacturing pipeline. Complicating that just to put out yet another version of an existing technology just doesn't seem logical. Yes, I'm aware that the Amazon tablet is on fire (pun intended), but competition alone won't force the company's hand before it's good and ready. Based on past behavior, there's even a decent chance that Apple is looking for ways to simplify things by whittling down its product variations, not expanding on them. For these reasons, I doubt it will happen this year. I could see a smaller iPad happening later on, perhaps after Cupertino has streamlined its other offerings or its iPad sales have waned. But we ain't there yet. NFC: Simply put, I'd be shocked if the iPad got NFC before the iPhone. 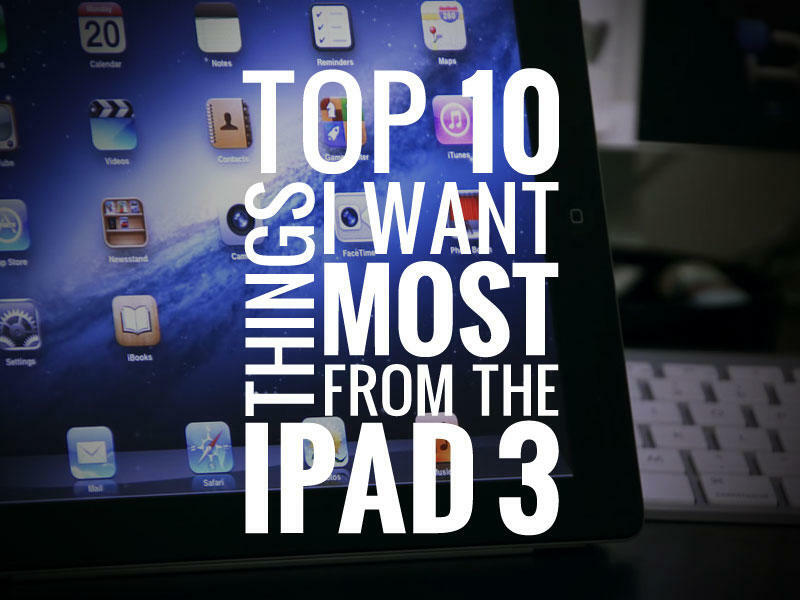 So that rounds out my most-wanted list of next-generation iPad features and specs, along with some bonus predictions. Do you agree? Disagree? Spot a hole in this or the other list? Chime in. And if you have some fervent desires or predictions for the new Apple tablet, let us know what those are in the comments.